The number of investors in India has risen with the increasing knowledge of the fact that people must secure their future. But somehow, the idea of index funds has remained unnoticed by most investors. This is mostly because performance is the primary reason why most of the people invest in India. We have identified the major areas of concern and benefits when a person invests in Index funds in India. This will help you establish if Index funds are meant for you or not. Why are Index funds so popular in the US? What about Index Funds in India? What makes Index Funds Less Popular in India? Index funds do not call for a lot of legwork when it comes to the fund management. This is why the costs related to these funds are relatively low as well. On the other hand, Mutual funds require the fund manager to keep a close eye on the portfolio performance and make sure that it consistently outperforms the market on various parameters. This means that the fund manager identifies low-performing stocks, when the situation arrives, and exclude such stocks from the portfolio to replace them with better-performing stocks. Index funds, on the other hand, do not need so much of active management. These funds invest money in a pre-set portfolio of stocks picked according to the investment strategy of the index fund. In India, we have two popular stock market indices – Sensex and Nifty. With 50 companies listed on the National Stock Exchange, its index, Nifty is the most popular index in India. Sensex, on the other hand, has 30 companies listed on the Bombay Stock Exchange on its index. These companies have pre-defined allocations for each of the stocks. 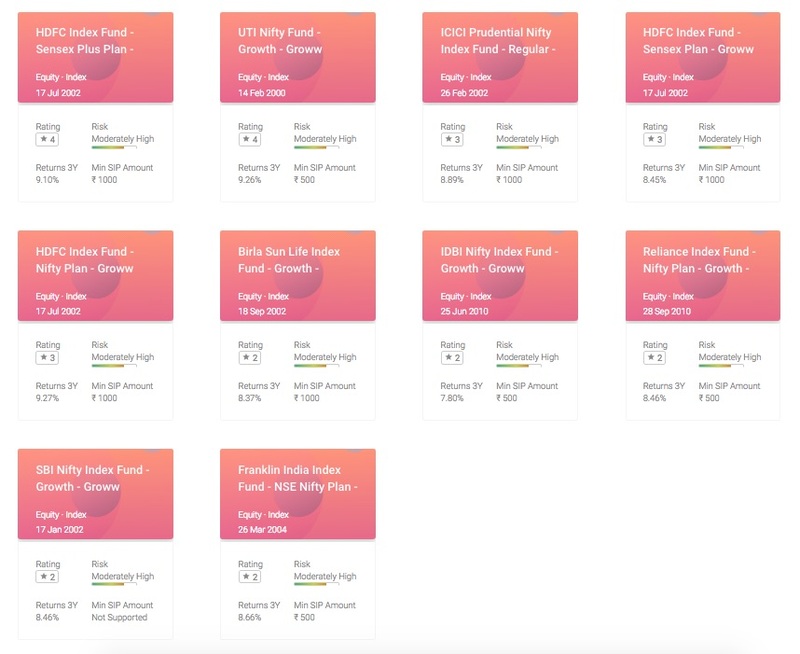 A passively managed fund simply identifies the stocks and their proportion in the market index and then they mirror the same in the portfolio. When any of the stocks change in proportion, the portfolio is adjusted to reflect the changes. Index funds do not require active research on the investment opportunities to find out which stocks to buy and at what prices or when. Index funds simply require passive management of the funds so that they are invested in the pre-set portfolio. When there is a change in the market index, the fund should replicate these changes to reduce the tracking error. The success of index funds lies in minimizing the tracking error so that it reflects the market index as closely as it can. If you were to invest in an active fund, the fund manager would track each stock in the portfolio and ensure that they are over-achieving as compared to its benchmark. Many of the funds aim at delivering a performance better than the two market indices in India. This means that the fund managers will warily eye the markets and carry out important research and analysis to perform well and rise above its benchmark. This is why Indian investors prefer to invest in active funds rather than passively managed index funds. After all, everyone wants better returns. Most investors in other countries like the USA and Europe find index funds to be a great success. Research on investments in the US has shown that over a given period of time, a large number of actively managed funds usually fail to beat the market. This is because they have a far more efficient market than India. You may have come across the sales pitch of Warren Buffet and Benjamin Graham recommending Index funds. What is being told is true, but it does not make complete sense unless you realize that they are talking about the American markets. Index funds in USA track indices which contain almost 500 to 5,000 companies. In the American market, the cost associated with other funds usually eats into the returns of the investor. In addition to the high fee structure of the funds, active management of these funds is not as effective since most fund managers find it difficult to beat the market with consistency. But these are the reasons for the popularity of index funds in other markets which are far more efficient and well-managed than the two market indices in India. If you are investing in India, then you must concern yourself with the market in the country so that you can make judicious decisions regarding your investments. The diminished presence of index funds in India is solely because it does not provide adequate returns. The two market indices, Nifty and Sensex, have a very small number of companies on the index. And this is clearly not indicative of the actual Indian market which is broader and more diverse. So if a company has potential but it isn’t big enough to reach one of the indices then it will not be a part of the portfolio. Similarly, if a big company has most of its shareholding held by promoters then it will not be able to find itself in one of the two market indices which mean that your index funds will not be able to take advantage of such well-performing companies. On the other hand, a fund manager for actively managed funds will see this as an advantage and add it to the portfolio. Because other countries have a stronger and more robust market, index funds are seen as a profitable investment in such markets. The fact that these markets usually perform well and actively managed funds in such markets often fail to reach the benchmark makes index funds a sensible investment for such markets. So Warren Buffet and Benjamin Graham were talking wisely about investment in their country. But since the Indian market is yet to reach competence in certain parameters, actively managed funds usually beat the market and perform better. A wise investor will see adequate reason to stick to actively managed funds in the Indian market. While Sensex may be considered as a barometer of the Indian market, it is not an ideal guideline for investment. The problem lies in ample diversification to make sure that the index includes companies from different sectors of the Indian market. At this time, Sensex does not have sufficient diversification in such terms. Important sectors like shipping, aviation, textiles, and tourism have not been adequately explored by Sensex. By limiting the sectors, it limits the chance of the index to mirror the actual Indian market. Even when a sector is represented by the index, the selection of the companies from the sector may not always be the best investment. Usually, large companies with liquid stocks find their way to the list of Sensex or Nifty’s index. But a wise investor will identify the potential of a company’s future and use more than just one parameter to invest in the company. Since index funds rely on the index it is mirroring for buying or selling the stocks, these funds will usually include stocks that may be underperforming for a substantial period of time, till the company is not dropped out by Nifty or Sensex’s list of companies. The two indices experience a number of fluctuations throughout the day and there is no surprise in a company being dropped from the list to add a new, better performing one to it. While the working of these two indices makes sense, the problem lies in the fact that an underperforming stock may take up part of the share of your investment till the time it is on the list. Unlike actively managed funds, you do not have the option to do away with such companies by removing them from your portfolio. One of the things that are often considered to be a benefit of index stocks is the fact that it does not require an investor to continuously gauge the market. But what may be a benefit in other more established markets is a flaw for the Indian market. This is because fund managers or individual investors have the ability to wisely look into the past records of the company and its future potential to figure whether it will be a prudent investment or not. This helps them beat the market and gain better returns. Index funds, on the other hand, are devised to mirror the market, so the reality is that they would not be able to over-perform or under-perform when it is mimicking the market index. Indian investors will not be able to find satisfactory returns from such funds because of the fact that they perform at par with the market. While a conservative investor may feel this is good, studies will show that other funds in India usually perform better than index funds. Every time a company is removed from the list of the market index that the index fund is mirroring, stocks for that company will have to be sold. Since a company is removed mainly when it is under-performing, this means that you will be selling the stocks at a relatively lower price. On the other hand, the company that may have been introduced to the list will usually be a high performer. To comply with the characteristic of index funds, stocks for the newly listed company will have to be bought, which are usually at a higher cost. For the Indian market, buying high and selling low seems irrational; especially when the gains are not as substantial as other funds. Matching the weight of the market index is more suitable for dynamic markets where indices are put together with more parameters in consideration. The Indian market presents two very basic indices that can be mirrored by index funds. The absence of dynamically managed indices makes it difficult for index funds to do well in India. Most countries where investors swear by index funds usually have innovative indices that they can take advantage of. Even though we have indices within the stock exchange, these indices are not available for investing which limits the potential of index funds. The Indian market is brimming with investing opportunities beyond these indices and when invested judiciously, an investment in actively managed funds can lead to a substantial amount of returns. If you do not have any faith in fund managers then investing in index funds may be suitable for you. No investment is immune from risks. Keeping in mind that fund managers may end up making the wrong choices or forecasting the wrong trend, other funds have a higher level of risk than index funds which are meant to automatically mirror whatever the market does. Passively managed index funds do not require a person to actively monitor the markets and make decisions regarding the portfolio. This means that the cost of managing these funds is fairly lower than other funds. If you do not want to give away your returns in the form of costs then you will find this to be a good investment. But market analysts usually find that what other funds lose out on cost, they usually make up on returns. Sensex and Nifty incorporate those companies that are doing well and have an excellent reputation in the market. So if you are looking for exposure in the market, especially in stocks that carry a large market value, then begin with Index funds. It’s a bit too early for Index funds in India. The Indian market provides many opportunities to investors in mutual funds, which can provide better returns on the investment. The prudent fund managers are delivering exceptional returns on actively managed funds. While they may be popular in other economies, India is still not ready for the index funds. What is the difference between ETF and Mutual Fund? How To Make Lump Sum Investments In Mutual Funds?